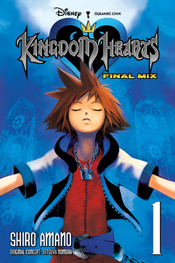 KINGDOM HEARTS: FINAL MIX Volume 1 + 2 Covers Revealed! On May 28th 2013, the first two omnibuses of the KINGDOM HEARTS manga series will be released in North America by Yen Press. 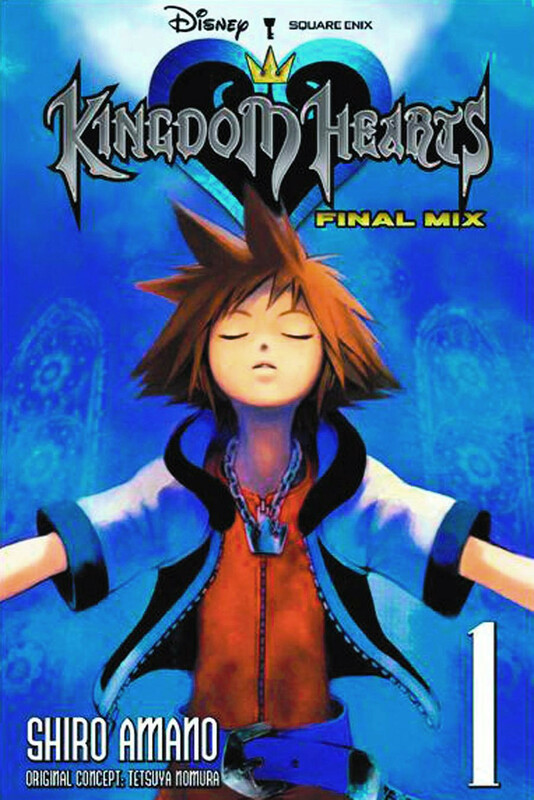 The covers for the KINGDOM HEARTS: FINAL MIX Volume 1 & 2 have been revealed and you can view them below! 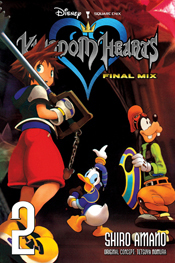 Do not forget to pre-order the rest of the KINGDOM HEARTS manga series! 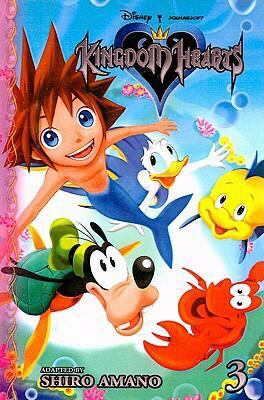 After a terrible storm shatters the peace of his tropical island home, a young boy named Sora is set adrift from his world and his friends, Riku and Kairi. Meanwhile, Disney Castle is in an uproar when it is discovered that King Mickey has gone missing, leaving it up to Court Wizard Donald and Captain Goofy to find him! When Sora, in search of his friends, and Donald and Goofy, in search of their king, cross paths, their fateful encounter will change the destiny of the universe forever! Sora, a young boy who lives a peaceful life on his tropical island home, is set adrift when a horrible storm wrecks the world he loves and separates him from his friends, Riku and Kairi. In another world, the Disney castle is in chaos when King Mickey goes missing, and it's up to Donald, the court magician, and Goofy, the captain of the army, to find their king. When both Sora and the King's allies happen upon each other and learn that the ills that have befallen their worlds are the doing of dark beings without hearts known as the Heartless, the three recent acquaintances take up arms together in an epic quest to travel to unknown worlds, set those worlds right, and find their friends!! Eh. just the covers from the original Vol. 1 and Vol. 4. Slightly disappointing, though I expected as much. Something about the colors looks very off. Probably just terrible JPEG compression tho. Still gotta preorder my copies. And honestly, I'm sort of glad they recycled old artwork for these releases. 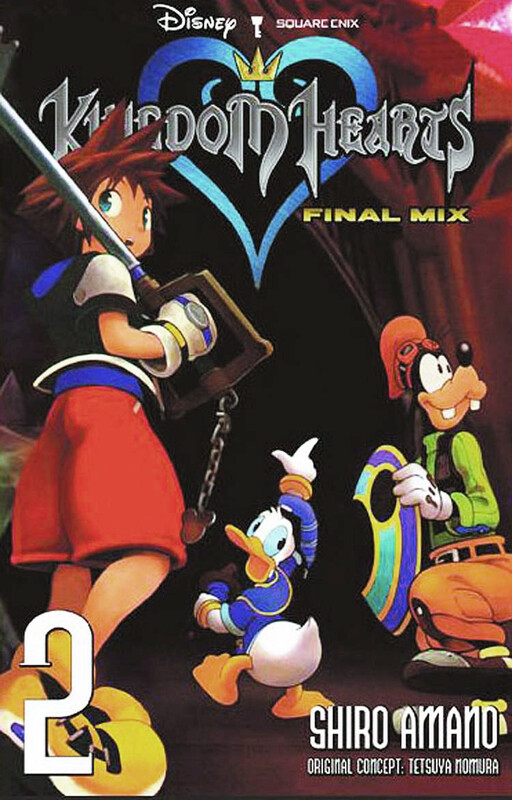 Remember the last time there was new cover artwork for the KH manga? Is there some relevant change in the Manga because it's titled FINAL MIX? Since I have the Ultimanias and they are listed as some Ad in the end I was always wondering if I miss out something great and funny. I hear they recolored the Heartless. You just can't tell because it's in black and white. 8D And they speak in English rather than Japanese like in the original. I've tried to color correct the images and here they are. Aw, I adore the Atlantica cover. It's so colorful, has good composition, and just makes me smile. It'll be interesting to see any noteworthy changes in translations. I don't remember if there were (m)any discrepancies in the Tokyopop serialization. I haven't read those in a long time. Still, I'm glad Yen Press has decided to start from scratch. What you got against Atlantica?!?!? I was hoping for some new Amano artwork, but I was expecting that previous covers would be used. KH1 Atlantica is a great world. The Kingdom Hearts Manga is sooooo awesome. It's so funny and it was really unique experiencing the KH story in a different way. The KH Manga was the first Manga I've ever owned and I cannot wait to read it again...cause I accidently lost my copies. Btw, is this version of the Manga any different from the original? It'll have new translations done by Yen Press but otherwise no, everything remains the same. I agree! However, it seems like from KH1, people always complained about how bad the controls were (I thought they were fine though) and in KH2..well...let's not even BEGIN to discuss what went wrong in KH2 haha and now this cover! ATLANTICA NEEDS LOVE!!! Replaced the images with the better quality covers Yen Press uploaded onto their website. We're gonna get the prostitute propositioning Sora the proper way and Donald's cursing and even Cid. *cry* This is all I ever wanted. Got my copies of Kingdom Hearts! And there are six additional pages containing a new Final Mix story. Fierce Roxas, cutie Sora looking slightly older, Enigmatic Man being enigmatic and RIKU! These are indeed great covers. Though I seriously can't see Yen Press without adding a "Sid" after Yen. also I like the sound of that added story. I encourage you to post about the differences and which you prefer! Yen Press did a really great job with the mangas. The bindcover is beautifully made. So much agreement it is ridiculous. On my shelf I have the Tokyopress and Yes Press versions next to each other and the Tokyopress ones are just...well...really disappointing. Also, were the new segments at the end of Vol. 2 in the Japanese Final Mix versions? Please tell us any notable differences. Yep! He was waddling to find Goofy when Donald first finds King Mickey's letter. Um, in Traverse Town there is a prostitute that in the original Tokyopop translation says "Let me show you around." but in the Japanese version it was a lot more playful in tone. The Yen Press version says "Why don't you let big sis here show you around ♥"
xD That sounds very funny can't wait to read it! Tokyopop changed the drink. In the original Japanese version it was barley tea, but they made it lemonade. Yen Press has changed it back to barley tea. Yeah. Outside of the prostitute character. I felt that the characters were better translated. For example in the scene where the Disney villains were discussing the Cheshire Cat, the Yen Press translation makes it clear which one is talking just ny the choice of words they use (Hook says they should have sent him to Davy Jones Locker.) where as the dialogue is so generic in the tokyopop version anyone could be saying those lines. Also, I wonder if the dialogue they gave the enigmatic man is from 1.5? Woo just got both volumes in the mail! :D I'm off to read now! Cant wait to see what the new content is! And the translation, of course! Questions for anyone who has read the final mixes yet or have the original versions because I haven't read the originals in a long time. 1) Why do the final mixes go in the opposite directions of the others? 2) I saw the bonus story at the end of volume 2 but between Episode 19 and 20 there's a bonus episode where it ends with Riku meeting Maleficent. Is that another extra or was that in the original versions? In Japan they made the manga read from left-to-right, probably to make it feel more like a Western comic book and give it that "Disney" feel, so the TP and YP prints matched that. It seems like something that would have confused the Japanese readers, and with CoM they went ahead and made it the traditional right-to-left style. I just picked up vol 1 and 2 from my book store and I'm really enjoying them. The only thing that surprised me was that the rating is "all ages" even though the website clearly says it is "teen".